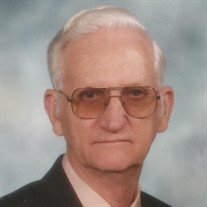 Carlton McKinnon, 94, of Arkadelphia, went to be with his Lord on November 5, 2018. He was born on July 25, 1924 in Smackover, Arkansas to Little Owen and Effie Merritt McKinnon. A dedicated member of Shiloh Baptist Church, he served as a deacon and Sunday School superintendent there. He was a World War II Veteran of the 8th Air Force, and was stationed in Deopham Greene, England. Carlton retired as a Line Crew Superintendent from South Central Electric Co-op with over forty years of continuous employment. He was preceded in death by his parents; wife of 55 years, Claudia (Hughes) McKinnon; sisters, Evelyn Fowler and Florine Queen; and brothers, Candace, Delbert and Doyle McKinnon. He is survived by his daughters, Joan Selvidge and her husband Larry of Hot Springs Village, Arkansas, and Jean Bateman and her husband, Martin of Clarksville, Arkansas; son, Edward McKinnon of Hope, Arkansas; grandchildren, Jeff, John, and Jimmy Bateman, Katie Moseley and Kelli James; great-grandchildren, Whitney, Jordan, Peyton, Ben, Hailey, Isabelle, Nicholas, Kathryn, Faith, Gunner and McKenna; and one great-great-grandchild, Braelen. The McKinnon family wishes to extend their deepest gratitude, respect and love for the outstanding care that Carlton received from Twin Rivers Health and Rehab and The Plaza. Visitation will be held 6:00 - 8:00 p.m. Wednesday, November 7, 2018 at Ruggles Wilcox Funeral Home. Funeral service will be held on 2:00 p.m. Thursday, November 8, 2018 at the funeral home, followed by burial with military honors at Shiloh Cemetery in the Shiloh/Oakland Community, south of Arkadelphia. Dr. Marvin Pate and Bro. Freeling Clowers will officiate.